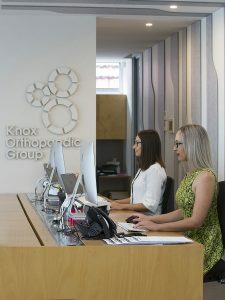 The surgeons at KOG aim to provide excellence in patient care to ensure the best possible outcome for all patients, regardless of whether you are with us for a hip replacement or visiting a knee specialist at our practice in Melbourne. For patients requiring a surgical procedure, the experienced office staff at KOG will guide them through the process providing comprehensive information about the operation. This will include out of pocket costs and information about hospital admission. As it is a very important decision to undergo surgery, patients will be given time to discuss any concerns or raise any questions with their knee and hip specialist at the consultation and with the office staff at the time of booking surgery. Patients are not hurried or pressured to make a decision. If more time is required, patients are encouraged to discuss this further with friends or family and return for a further consultation before booking their operation. WorkSafe or TAC patients are required to settle consultation accounts at the time of consultation. If surgery is required, the treating surgeon will write a letter to the relevant authority to obtain acceptance of liability. This process sometimes takes several weeks. Our team of orthopaedic surgeons have moved into our original consulting rooms which has been newly renovated to accommodate our patients. 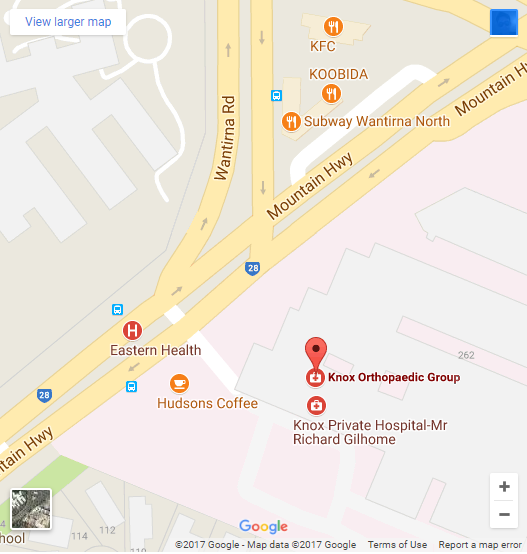 We can be found at 262 Mountain Highway in Wantirna, adjacent to Knox Private Hospital. Our practice has direct access to the hospital, giving our patients the flexibility of visiting a knee or hip specialist with x-ray and pathology facilities onsite. If you would like to contact a KOG hip or knee specialist at our surgery in Melbourne, please don’t hesitate to call us on (03) 9887 1488. For general enquiries, you can also get in touch by filling out our online enquiry form.